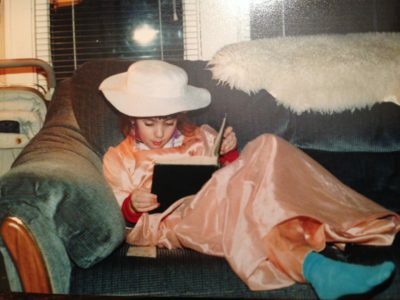 Creative Learner Portfolio Manager Katie Huston at 5 years old, reading in dress up. At DGMT, we want all South African children to be able to read, and to love reading. As we work with committed and passionate partners towards this goal, I am often reminded of key moments in my own literacy journey. “No – what?” Wisdom from Dad was magical; I was intrigued. “I’m reading this magazine.” He held it up, showed me the print. “But instead of saying the words out loud, I’m just saying them inside my head.” I tried it, and – to my dad’s relief, I’m sure – it worked. I felt like I’d just joined an exclusive club. Being read to didn’t stop once I could read on my own. Every night until I was at least 10, my mom, my sister and I gathered in my sister’s bed, working our way through the Little House on the Prairie series, then The Chronicles of Narnia, the Betsy-Tacy series and The Golden Compass. “Please!” we’d beg when my mom closed the book. “Just one more chapter!” My mother would play hard to get at first, but if we promised to rub her back, she’d keep going. My grandpa told us dozens of “Papa Louie” stories, invented on the spur of the moment, about a universe populated with each family member’s alter-ego: Emily was Emiluka; Katie was Katina; Daniel was Danato. Every time, the story’s central dilemma was solved by a talking fish named Charlie. My next door neighbour Michelle, who was five years older, suggested one day that we should make our own library. The autumn I turned six, she came over every day after school to fold and staple paper, invent titles, brainstorm storylines and draw illustrations with us. My sister couldn’t write well yet, but she drew lots of pictures, and told the stories so my mom could write down the words. Michelle sometimes talked about the “big girl books” she read, and I couldn’t wait to become a better reader so I could get to those books myself. Ms Brehler, my second-grade teacher, left my class hanging on her every word when she read through the Roald Dahl canon, using different accents and voices to bring each character to life. When she read us those stories – James and the Giant Peach, Charlie and the Chocolate Factory, The Witches – she was the coolest, cleverest, funniest person I knew, and she left all of us begging for more. Ms. Brehler also lent me a copy of Madeleine L’Engle’s A Wrinkle in Time and gave me what she called a “dialogue journal.” She encouraged me to write down my thoughts about the book, and then she responded. The message was clear: Stories belong to you. Your opinion matters. Every month, the Scholastic “book order” arrived in class: a four-page A4 pamphlet selling children’s and young adult books at heavily discounted prices, from R10 to R30. Each month, I lingered over the tiny pictures of book covers and the one-line teasers for days, ranking my top choices and hoping my mom would agree to buy me one or two. The library held an annual summer reading contest, where we had to set goals at the beginning of the summer – to read 20 books, say, or 20 picture books and 5 chapter books. At the end of the summer, as a reward for participating, we got to choose a brand-new book to take home. I would look forward to that day for weeks – to the new-book smell, and the chance to bring home a new friend. In many ways, I was exceptionally fortunate: I had college-educated parents who read books, magazines and newspapers. I had access to affordable books through a school mail-order programme, and a well-stocked community library. These factors can’t be underestimated – and we need to ensure that more of the conditions that support reading development are in place for every South African child. But many of the things I remember that really made the difference weren’t rocket science, and didn’t take a lot of money. Papa Louie stories and Roald Dahl’s books sparked my imagination. My parents encouraged my budding love of reading by taking me to the library regularly and buying books as a special treat. I had opportunities to choose the books I wanted to read and own, and to write my own books without anyone correcting my spelling. I idolised Michelle and Ms Brehler, who showed me how much fun the world of stories could be and invited me to become a part of it. Every South African child – every child in the world – should embark on a literacy journey that is exciting and fulfilling. It’s not just about doing well in school and being equipped for the future. The joy of hearing, reading and sharing stories is a basic human right – one that makes us happier, more empathetic, more resilient and more human. We recently created some resources to help all of us get involved in giving children the life changing gift: the opportunity to develop a love of reading. Have a look.